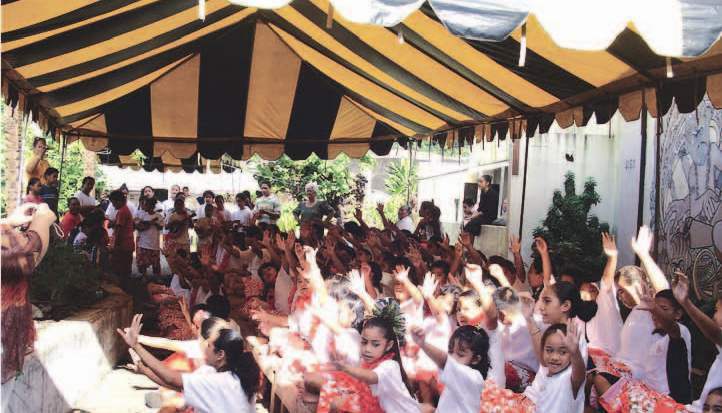 Children learn traditional skills at a heritage camp in American Samoa. American Samoa (population 68,000), located in the South Pacific Ocean, has been a territory of the United States since April 17, 1900. The Samoan archipelago was first inhabited more than 2,000 years ago and includes seven islands, five of which are currently inhabited. Western civilization first learned of the archipelago in 1722, and the first missionaries arrived in 1837. The U.S. Navy initially administered American Samoa (or Amerika Samoa, as it is known in Samoan), but that responsibility was transferred to the Department of the Interior in 1951. Local governance was restored to the territory in 1977, setting up a three-branched governmental system, similar to the United States. Samoan social organization is based on the land, with 95 percent of the land communally owned by families run by family-selected chiefs. On September 29, 2009, an 8.0 magnitude earthquake struck 120 miles from American Samoa, followed by a deadly tsunami. Several large waves destroyed the National Park Service visitor center and headquarters on Tutuila. Temporary offices and a visitor center have opened in Ottoville, eight miles from their former location. Efforts to recover from the extensive damage to the islands are ongoing. During World War II, American Samoa was the home of thousands of Navy and Marine service men and women, although the island saw limited combat. The World War II fortifications built at the entrance to Pago Pago harbor include gun emplacements at Blunts Point and Breakers Point. Both gun emplacements are listed on the National Register of Historic Places and have become popular tourist attractions. Until recently, the area had suffered from a lack of maintenance. The National Park Service joined with community members to restore the sites and make them more accessible to the public. The gun emplacements were cleaned and given a fresh coat of paint. Trails were cleared and established to improve access to the sites. New signage helps point visitors to the emplacements. The work has assisted in making the gun emplacements more attractive to the public while helping to preserve an element of the island's heritage. The National Marine Sanctuary of American Samoa, formerly known as the Fagatele Bay National Marine Sanctuary, is one of 14 such sanctuaries operated by the National Oceanic and Atmospheric Administration. It protects a coral reef area on the south side of the island of Tutuila, as well as historic shipwrecks. 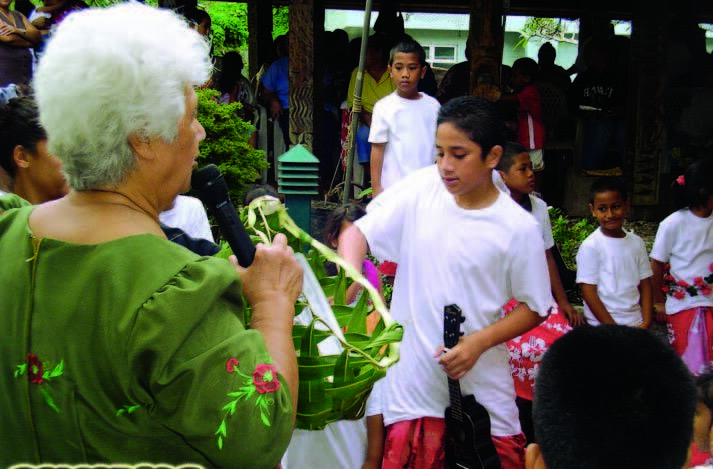 The Jean P. Haydon Museum displays various aspects of Samoa's history, culture, and natural history. The museum is housed in a National Register of Historic Places-listed building originally used as a naval commissary, and is in the U.S. Naval Station Tutuila Historic District. The museum offers classes to the island's children each summer, providing an opportunity to learn about heritage crafts such as weaving, tapa making, and printing. Elders from the surrounding villages are asked to teach the children the traditional skills. Flag Day is an annual event celebrating the anniversary of American Samoa becoming a U.S. territory. Held every April 17, the event is the largest on the territory, spanning two days of activities including traditional dancing and singing, parades, poetry contests, legends, and storytelling. Designated a Preserve America Community in February 2010.